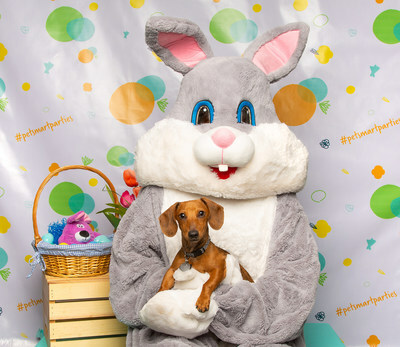 PHOENIX, April 2, 2019 /PRNewswire/ -- Pet parents are invited to bring the whole family to PetSmart's free in-store event for photos with the Easter Bunny. This annual event will take place April 13-14 from 12-4 p.m. local time at PetSmart stores across North America. Pet parents will receive a free digital photo from PetSmart and can take photos with their own mobile device. Pet parents can also include their pets in Easter celebrations by stocking up on pet favorites. With items starting at $3, it's easy to fill Easter baskets for all your pets this spring. PetSmart offers a full selection of springtime apparel, like this festive puppy pet dress, colorful spring toys, including a squeaker plush bunny dog toy, and treats that are both delicious and beneficial for pets, such as dental treats, that will keep their tails wagging. For the first time, fan-favorite philanthropic toys Chance and Friends will also be available for purchase starting in April through July. Traditionally offered only during the holiday season, these collectible plush toys will be sold for $5, with 10 percent of the sales going to help pets in need by supporting the work of PetSmart Charities. Bring the entire family to PetSmart's Easter Bunny photo event to get your social media-worthy photo and post using #petsmartparties. For more Easter toys and treats, visit www.petsmart.com. 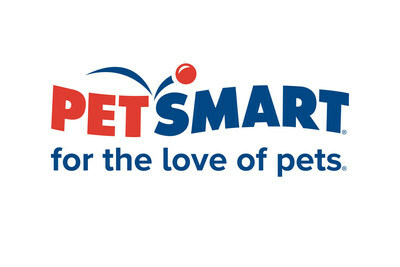 PetSmart, Inc. is the largest specialty pet retailer of services and solutions for the lifetime needs of pets. At PetSmart, we love pets, and we believe pets make us better people. Every day with every connection, PetSmart's passionate associates help bring pet parents closer to their pets so they, together, can live more fulfilled lives. This vision impacts everything we do for our customers, the way we support our associates and how we give back to our communities. PetSmart employs approximately 56,000 associates and operates more than 1,650 pet stores in the United States, Canada and Puerto Rico, as well as more than 200 in-store PetSmart PetsHotel® dog and cat boarding facilities. The retailer provides a broad range of competitively priced pet food and products, as well as services such as dog training, pet grooming, pet boarding, PetSmart Doggie Day Camp™ and pet adoption. PetSmart, PetSmart Charities® and PetSmart Charities® of Canada work with more than 3,500 animal welfare organizations to bring adoptable pets into stores so they have the best chance possible of finding a forever home. Through this in-store adoption program and other signature events, PetSmart has facilitated more than 8 million adoptions, more than any other brick-and-mortar organization. In May 2017, PetSmart acquired Chewy.com, a leading online retailer of pet food and products in the U.S., which operates as an independent subsidiary. Turn your passion for pets into a career you'll love! Visit careers.petsmart.com to learn more about corporate, retail store and Distribution Center opportunities.